Rod Guilford has enjoyed a long and successful career as a drag racer, competing in NHRA events in Colorado and many other states. 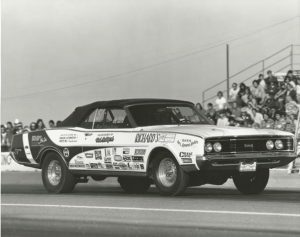 He has also been a successful car owner/engine builder and crew chief for numerous drag racing and circle track racing teams, winning at the local, regional and national level from 1961 through 1991. He won his first NHRA class trophy at age 17, driving a 1950 Olds to victory at Cheyenne Dragway in Cheyenne, Wyoming. In 1969, he was given the opportunity to prepare and race a Mercury Cougar provided by the Ford Motor Company for Stock division competition in the NHRA while working for Kenz and Leslie, and the following year prepared and raced a 1970 Mercury Cyclone in NHRA Stock and Super Stock competition, driving for the Kumpf Lincoln-Mercury dealership. Over the next 42 years, Rod set 13 national NHRA records, and ran in 15 divisional final rounds, with seven division championships to his credit. As engine builder or crew chief, he won a NHRA National Stock Points Championship, as well as numerous NHRA Division 5 titles.Over the next 42 years, Rod drove to seven division championships and was runner up in eight more. As engine builder or crew chief, he has 13 championships to his credit, as well as multiple NHRA Division 5 titles. He has also been active as a crew chief in circle-track competition, with six Colorado Auto Racing Club championships, one Pro Truck championship, two Colorado National Speedway Challenge Cup titles and two CNS track championships to his credit. Rod Guilford has enjoyed success at some of the highest level of competition in multiple racing divisions in Colorado, and is a richly deserving inductee into the Colorado Motorsports Hall of Fame, Class of 2018.